Based just past the ‘Bridge Over the Atlantic’ on Seil, Marine biologist David Ainsley set up Sealife Adventures in 1988 and is the most experienced charter skipper in the Forth of Lorn Special Area of Conservation. Sealife Adventures specialises in whale watching and Corryvreckan whirlpool trips but can be charted for private use to wherever you wish to go in the area. With nearly 900 horsepower, Sealife Adventures’ boat is one of the most powerful charter boats of its size ever built. The twin engines are efficiently silenced and soundproofed to avoid disturbance to wildlife. 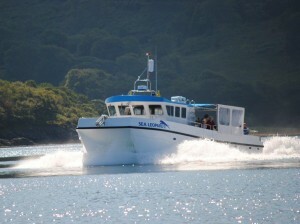 Seafari, based in Ellenabeich, Isle of Seil, run a number of different tours; dedicated whale watching tours when whales are being sighted, tours to the Garvellachs to visit and land on these enchanting islands and should you fancy an all day excursion to an island which would take hours by ferry, join them for tours to Colonsay, Iona and Staffa. Corrywveckan and wildlife tours are run daily, along with their poplular Whirlpool Specials during Spring tides when the tidal range is at its greatest. They operate a fleet of modern Rigid Hulled Inflatable Boats. 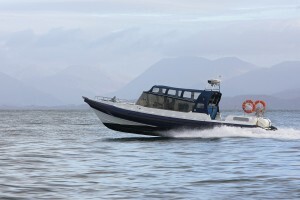 Seafari were the first company in Scotland to offer dedicated wildlife RIB trips. 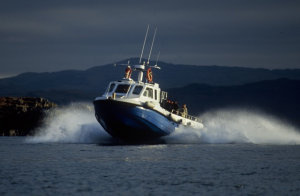 Operating out of Ardfern, 6 years experienced skipper/wildlife guide Lindsay Johnston offers boat trips aboard Sea Leopard II to view the abundant wildlife and spectacular scenery of the Sound of Jura and the Firth of Lorn or for a Whirlpool Experience to see the Corryvreckan in action. 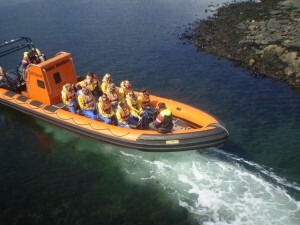 Puffin and whale watching day trips via Fingal’s Cave and Garvellach tours are also an option. Sea Leopard II is a purpose built 12 meter Blyth catamaran powered by twin Iveco 400hp engines giving a cruising speed of 12 knots, top speed 18 knots. Coastal connections offer regular ‘Wildlife and Castles’ tours around Kerrera and Mull, and trips to Tobermory. You can charter a boat with them for up to 12 people. 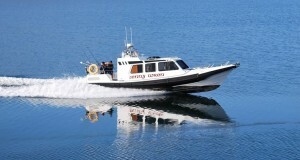 Their 11 metre cabined RIBs provide a safe, dry and comfortable environment in which to relax and take in the scenery and wildlife along the West Coast. Barry Adamson at Corrie House B&B, just around the corner in Craobh Haven, can offer trips for 2-8 people on his boat Jenny Wren. With a fully qualified skipper the boat has a heated cabin, toilet and drinks are available. 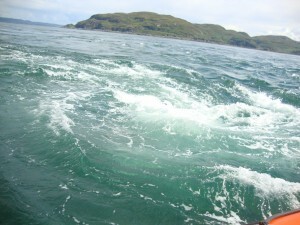 Specialising in Corryvreckan whirlpool trips, wildlife, fishing, distilleries, island picnics and as a fast ferry service. Private skipper charter available and bespoke packages including the unique Fish, Fillet & Fry incorporating Corrie Cook School. Barry operates all year round, weather permitting.